The Tribute: (My beloved) David Bowie shuffled off the mortal coil … but to me he will always be immortal. My first love, an original in a sea of imitators, a true innovator — an inspiration of mine since the tender age of 13. I have loved him for many years, many reasons … His unflinching originality, his wonderfully otherworldly talent. His voice, that sends me to the stars … his singular yet ever-evolving style that others could only wish for … his music, which was like no other … his multifaceted experimentations, his courage, intelligence, and beauty. The Starman, who was also down to earth ... We are collectively grieving, collectively admiring. There have been countless tributes all over various media outlets already, but this one is mine… And let me say how much I've been enjoying all the radio stations palying Bowie marathons -- Just a staggeringly immense catalog of fantastic music -- it's mind blowing, really. 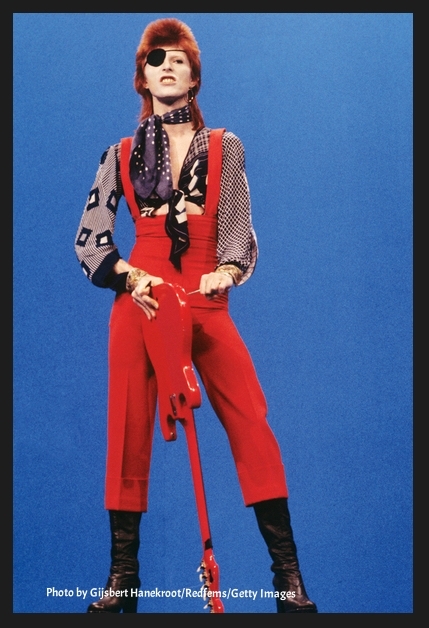 He influenced fashion, the visual arts, the character of performances and much of popular culture along the way. This being has had a huge impact, which is why he can never really die. The Case: Living slowly and beautifully - ads value. Living fast and rushing - takes away, creating the feeling (an illusion) of lack. (I heard a Japanese restoration artist-craftsman say this recently.) -- I am a big advocate for conscious commerce — for slow-fashion, slow-food, small business, supporting artisans and craftspeople, etc. — In as much as we are able, aiming to slow it down...will have immense benefits to our well being. Knowing full-well that we cannot always do this, and that no one wants to be lectured on the detriments (of factory farmed food and factory farmed fashion) ... What I’d like to do is sing praises of being a conscious consumer, as often as we can — So, let’s continue our new year in optimism … In the immortal words of David Bowie - "It Ain't Easy..." (but) "We can be heroes …"
TIP: Don’t ask someone how an item of clothing makes you look. Ask yourself how it makes you feel — Then tell us about it. + One more tip we snagged from the gals at MR — “Just pony up and buy the coat. Red Modern Princess Style Coat “You know the one. It appears in all its unicorn-sourced, fairy-stitched glory at the start of the season, taunting you with its sheer perfection and four digit price tag. (NOTE: our price tag is only 3 digits!) You almost talk yourself into buying it five times before going for the Diet Coke version at Zara instead, (don't, really). Save your closet from more disposable outerwear and get something that lasts. You’ll be glad next year — and the five (+ years) after that.” — Yes. More Peeks of Capsule Collection -- Coming in Feb. I cannot let January go without some (Golden Globes) red-carpet commentary and such … Mind you, I find these award shows to be mostly boring glorifications, and overly pc. -- So, here’s my take. This year the fashions were a bit more interesting ... amongst a sea of the usual pretty gowns there were some cool dresses. The show was mostly a snooze … if not for Ricky Gervais wonderfully crass sense of humor ... I did however like what Dicaprio had to say about indigenous peoples — yes! I liked all the green & blue hues — much of the clothes were pretty… some not. Jennifer Lopez - that yellow gown was elegantly wow. Jamie Alexander - beautifully Deco-Esc green & black. Jennifer Lopez - that chartreuse-yellow gown. Lastly — Mercury RetroGrade Survival Guide — No, really we jest … hang on, y'all!